One of the keys to learning a language is consistent exposure over time. A small amount of Spanish in different formats is valuable, and it does not have to be complicated or time consuming. You can help teach your child Spanish with these surprisingly simple strategies. As I tell the parents of my students, all Spanish exposure contributes to learning. It is best to jump in and get started as you determine what is the best long term approach for your family. As you teach your child Spanish, you can always reevaluate and tap into new resources. If you are wondering how to teach your child Spanish, keep in mind that a little language every day or several times a week is more valuable than a longer time now and then. Keep it simple, short, and have fun! Music is language glue. It puts words and sounds into a child’s brain, and they stick! Sing songs with actions and watch music videos to provide context for the language. Not sure where to start? Try Super Simple Español, Rockalingua, Spanish Together, and Baila Baila. One of the best ways to teach your child Spanish is to work the language into routines. Start with a few of these 61 common Spanish phrases for kids and use them naturally. There is a printable list and audio in the post. Once your child understands the first set, add a few more. Before you know it, she will understand a lot of Spanish! 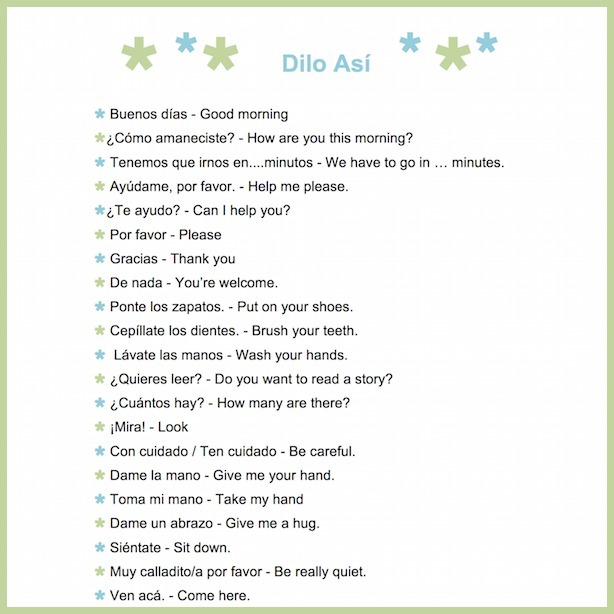 You can also add Spanish to your routines with these ideas for bedtime, and songs for cleaning up and washing hands. Technology can be a wonderful tool to supplement language learning. There are a lot of apps to help you teach your child Spanish, so you can try them out for a time and return to favorites. Some of the apps we like are Gus on the Go Stories, Endless Spanish, Think Bilingual and Peg and Pog. You will surely discover more, so please share your favorites in comments when you do. Video is the easiest way to expose kids to spoken Spanish from a variety of speakers. You can use videos designed specifically for Spanish learners like the Spanish Words Kids Love series. You can also choose scenes from favorite animated films and change the sound track to Spanish. Keep the clip short and repeat key words and phrases. Hearing small amounts of authentic language video is great for kids. Bilingual books are a wonderful resource for exposing children to language, and you can use them in simple ways to teach your child Spanish. You may choose to read the story in English and then identify key words in Spanish and in the illustrations. You can also read the story in English and choose one key sentence on the page to read in Spanish. Of course, if you can read the story in Spanish, that is fabulous! In that case, you might want to check out our best strategies for reading to kids in Spanish. Check out our Spanish Books for Kids Book List for favorite English books with integrated Spanish text, bilingual books and Spanish language books. It can be intimidating to teach your child Spanish. Because a language is so big, it can be hard to know where to start. Keep in mind that a little Spanish at a time is a good way to learn, and some Spanish exposure is 100 times better than none. 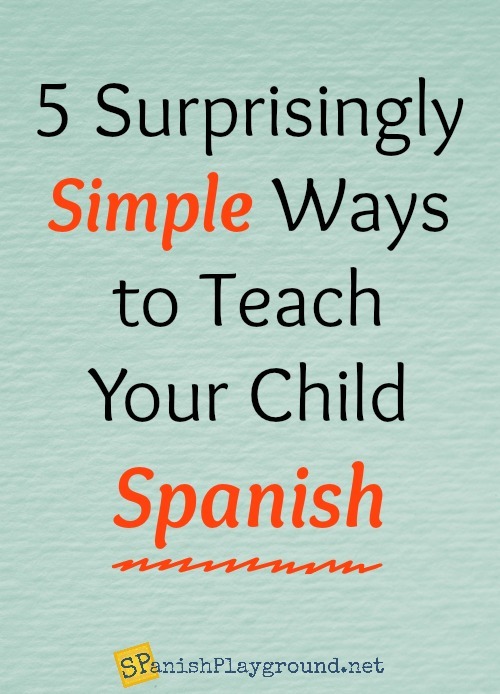 You can help teach your child Spanish by keeping it simple and fun.